The Report Authoring tools produce, as their end-product, RDL files that specify the way that the report will work. Report Builder is an ‘ad-hoc reporting tool’, and designed for IT-savvy users (normal users) to allow them to specify, modify and share the reports they need. It can be run directly from the report server on any PC with the .NET 2 framework installed. It allows the creation of reports derived from ‘report models’ that provide a business-oriented model of the data. These reports can then be managed just like any others. The Report Builder allows the users to specify the way data is filtered and sorted, and allows them to change the formulas of calculated columns or to insert new columns. These reports have drill-down features built into them. The Model designer in Visual Studio allows you to define, edit and publish ‘report models’ for Report Builder that is abstractions of the real data. This makes the building of ad-hoc reports easier. The model designer allows the programmer to specify the tables or views that can be exposed to the users who can then use the models to design their reports. One can also use it to determine which roles are allowed access to them. Report Manager is a web-based tool designed to ease the management task of connections, schedules, metadata, history and subscriptions. It allows the administrator to categorize reports and control user access. The RDF files can be uploaded to the report server using this tool and placed in their logical position within the hierarchical menu. There are alternatives. Such as using the Web Browser control or the Report Viewer control. The report viewer control, ‘Report Viewer’, ships with Visual studio 2005 and can be used in any Windows Form or web form surface, just by dragging and dropping. After you assign a report url and path, the report will appear on the control. You can configure the Report Viewer in a local report-processing mode where the application is responsible for supplying the report data. The information contained within a data source definition varies depending on the type of underlying data, but typically includes information such as a server name, a database name, and user credentials. A data source can be contained within a report, or it can be shared by several. In the first case, the definition for a report-specific data source is stored within the report itself, whereas for a shared source, the definition is stored as a separate item on the report server. A report can contain one or more data sources, either report-specific or shared. · Report Manager, which is represented by the Report Manager component in the diagram. Report Manager is a browser application that provides front-end access to the Reporting Services Web service. 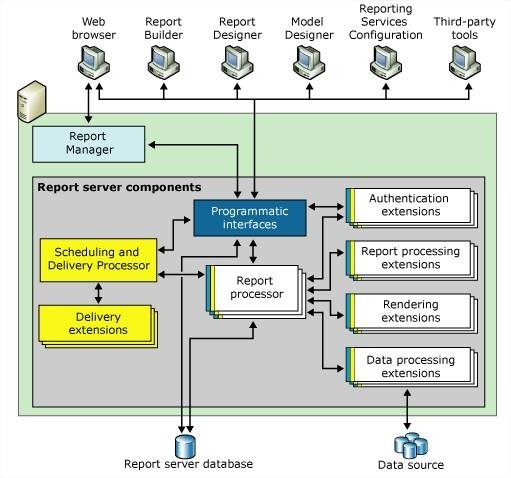 · Reporting Services Web service, this is represented by the Web service components in the diagram. This application handles on-demand, interactive report processing. · Background processing application, which is represented by the Windows service components in the diagram. This application processes reports that are triggered from a schedule and delivers reports to target destinations. The report server is a stateless server that stores all properties, objects, and metadata in a SQL Server database. Stored data includes published reports, report models, and the folder hierarchy that provides the addressing for all items managed by the report server. A report server database can provide internal storage for a single Reporting Services installation or for multiple report servers that are part of a scale-out deployment. The report server supports custom authentication extensions, data processing extensions, report processing extensions, rendering extensions, and delivery extensions. A report server requires at least one authentication extension, data processing extension, and rendering extension. Delivery and custom report processing extensions are optional, but necessary if you want to support report distribution or custom controls. Security extensions are used to authenticate and authorize users and groups to a report server. The default security extension is based on Windows Authentication. You can also create a custom security extension to replace default security if your deployment model requires a different authentication approach (for example, if you require forms-based authentication for Internet or extranet deployment). Only one security extension can be used in a single Reporting Services installation. You can replace the default Windows Authentication security extension, but you cannot use it alongside a custom security extension. · Open a connection to a data source. · Analyze a query and return a list of field names. · Run a query against the data source and return a rowset. · Pass parameters to a query, if required. · Iterate through the rowset and retrieve data. · Analyze a query and return a list of parameter names used in the query. · Analyze a query and return the list of fields used for grouping. · Analyze a query and return the list of fields used for sorting. · Provide a user name and password to connect to the data source. · Pass parameters with multiple values to a query. · Iterate through rows and retrieve auxiliary metadata. Rendering extensions transform data and layout information from the Report Processor into a device-specific format. Reporting Services includes seven rendering extensions: HTML, Excel, CSV, XML, Image, PDF, and Microsoft Word. When you request a report from a report server through a Web browser, the report server uses the HTML rendering extension to render the report. The HTML rendering extension generates all HTML using UTF-8 encoding. Excel Rendering Extension: The Excel rendering extension renders reports that can be viewed and modified in Microsoft Excel 97 or later. This rendering extension creates files in Binary Interchange File Format (BIFF). BIFF is the native file format for Excel data. Reports that are rendered in Microsoft Excel support all of the features available for any spreadsheet. XML Rendering Extension: The XML rendering extension renders reports in XML files. These XML files can then be stored or read by other programs. You can also use an XSLT transformation to turn the report into another XML schema for use by another application. The XML generated by the XML rendering extension is UTF-8 encoded. Image Rendering Extension: The Image rendering extension renders reports to bitmaps or metafiles. The extension can render reports in the following formats: BMP, EMF, GIF, JPEG, PNG, TIFF, and WMF. By default, the image is rendered in TIFF format, which can be displayed with the default image viewer of your operating system (for example, Windows Picture and Fax Viewer). You can send the image to a printer from the viewer. Using the Image rendering extension to render reports ensures that the report looks the same on every client. (When a user views a report in HTML, the appearance of that report can vary depending on the version of the user’s browser, the user’s browser settings, and the fonts that are available.) The Image rendering extension renders the report on the server, so all users see the same image. Because the report is rendered on the server, all fonts that are used in the report must be installed on the server. Report processing extensions can be added to provide custom report processing for report items that are not included with Reporting Services. By default, a report server can process tables, charts, matrices, lists, text boxes, images, and other report items. If you want to add special features to a report that require custom processing during report execution (for example, if you want to embed a Microsoft MapPoint map), you can create a report processing extension to do so. The background processing application uses delivery extensions to deliver reports to various locations. Reporting Services includes an e-mail delivery extension and a file share delivery extension. The e-mail delivery extension sends an e-mail message through Simple Mail Transport Protocol (SMTP) that includes either the report itself or a URL link to the report. Short notices without the URL link or report can also be sent to pagers, phones, or other devices. The file share delivery extension saves reports to a shared folder on your network. You can specify a location, rendering format, and file name, and overwrite options for the file you create. You can use file share delivery for archiving rendered reports and as part of a strategy for working with very large reports. Delivery extensions work in conjunction with subscriptions. When a user creates a subscription, the user chooses one of the available delivery extensions to determine how the report is delivered. When you first open Business Intelligence Development Studio, the Start Page appears in the center of the Business Intelligence Development Studio user interface. This page displays a list of recently updated projects; help topics, Web sites, technical articles, and other resources; links to product and event information from Microsoft; and by default, a list of articles from the RSS feed of the specified news channel. After you open an object in a project, the designer for working with that object also appears in the center window. In Solution Explorer, you can create empty solutions and then add new or existing projects to the solution. If you create a new project without first creating a solution, Business Intelligence Development Studio automatically creates the solution too. When the solution includes projects, the tree view includes nodes for project-specific objects. For example, the Analysis Services project includes a Dimensions node, the Integration Services project includes a Packages node, and the Report Model project includes a Reports node. The Properties window lists the properties of an object. You use this window to view and change the properties of objects, such as packages, that are open in editors and designers. You can also use the Properties window to edit and view file, project, and solution properties. Fields in the Properties window have different types of controls embedded that open when you click them. The type of edit control depends on the particular property. These edit fields include edit boxes, dropdown lists, and links to custom dialog boxes. Properties that are shown as dimmed are read-only. The Toolbox window always displays the General tab, and may also display tabs such as Control Flow Items, Maintenance Tasks, Data Flow Sources, or Report Items. Some designers and editors do not use items from the Toolbox. In that case the Toolbox contains only the General tab. 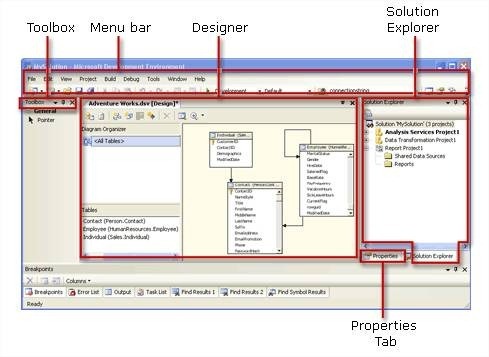 The Designer window is the tool window in which you create or modify business intelligence objects. The designer provides both a code view and a design view of an object. When you open an object in a project, the object opens within a specialized designer in this window. For example, if you open a data source view in any of the business intelligence projects, the designer window opens using the Data Source View designer. When you create a new solution, Business Intelligence Development Studio adds a Solution folder to Solution Explorer and creates files that have the extensions .sln and .suo. · The *.sln file contains information about solution configuration and lists the projects in the solution. · The *.suo file contains information about your preferences for working with the solution. Hope this explanation is useful for you ! !